Thoughts about this and that. 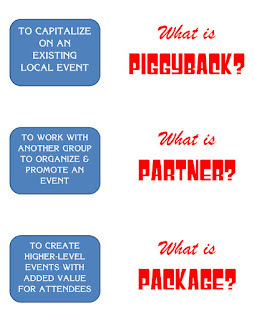 Note: This originally appeared on my friend Ted's blog, but I'm reposting it here. Watching a movie again is different from rereading a book. First of all, I like rewatching movies. Well, some movies. There are certain movies I'm embarrassed to admit that I paid good money to sit through once, but Indiana Jones and the Last Crusade is not one of them. I saw it twice at the Rolling Acres Cinema when it came out and will always watch if I come across it while randomly flipping through channels. Now that Hulu Plus offers movies as well as TV shows, I have access to the whole Indiana Jones series, but the only one I've actually rewatched is The Last Crusade. Ahem. What else caught my attention? Oh yes, the bit where Indy needles his dad about forgetting the clues that will get them through the booby traps guarding the grail. Henry replies, "I wrote them down in my diary, so that I wouldn't have to remember them," which made me think of the Field Notes motto: "I'm not writing it down to remember it later, I'm writing it down to remember it now." I have a ton of Field Notes notebooks because I always think I'm going to compile important notes and ideas that I'll want to refer to later, but then I realize that my handwriting and sketches are never going to look anywhere near as photogenic as Henry's notebook about the Holy Grail and I give up. Besides, keeping a diary still strikes me as such a teenage girl thing to do, and I have a hard time reconciling that concept with a bearded and tweedy Connery. Another concept that's hard to reconcile with Connery — bearded, tweedy, or otherwise — is playing the Damsel in Distress role, but that's essentially his part here: getting rescued by the hero, bantering and bickering with the hero, causing a few problems for the hero (setting the fire at the castle! shooting out the rudder! ), finding a few solutions for the hero (revealing the spiral staircase! spooking the birds with the umbrella! ), and providing the emotional stakes as the hero tackles the film's final quest. And, of course, he shows the hero he really loves him by finally calling him "Indiana." 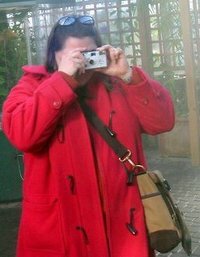 I'll show the hero I really love him by disavowing any knowledge of Temples of Doom or Kingdoms of the Crystal Skull. I haven't been to the actual movies in ages — even though I have two free passes to Regal Cinemas burning a hole in my pocket. 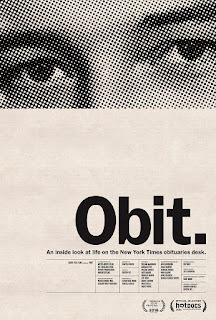 There's not a lot in the theaters that I actually want to see, but I was interested in Obit, a documentary about obituary writers. Many people read the obituaries, but who thinks about writing them? The film is a peek behind the curtain, showing us the process for producing these summaries of someone's fourscore and ten. Long story short, I loved it — much like The Paper, another movie about working at a newspaper and one that I have a soft spot for because I first saw it during college in a small theater filled with fellow journalism students, many of whom worked for The Post. Watching Obit definitely gave me some flashbacks to my college newswriting class, where an obituary was one of the first assignments. 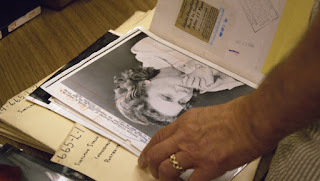 Plus, the footage of the paper's morgue fascinated the latent archivist in me. 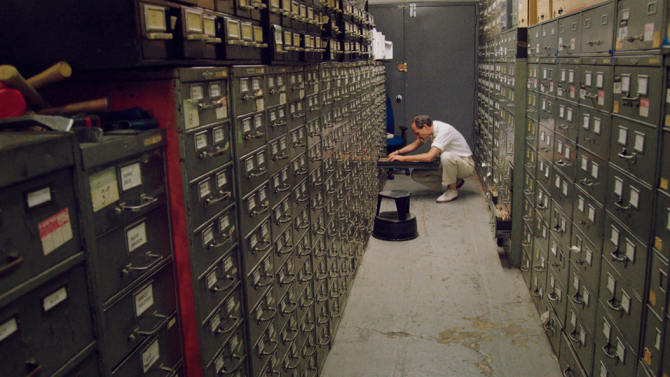 All those filing cabinets full of clips! While I was watching the interviews with the various New York Times staffers who compose the daily paeans to the dearly departed, I could've sworn I read a book a few years ago about people who write obituaries. 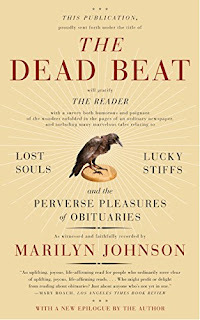 Some online digging makes me think it must've been The Dead Beat: Lost Souls, Lucky Stiffs, and the Perverse Pleasures of Obituaries, because it mentions Margalit Fox, who is featured in the film. Maybe I'll request it from the library again, because I can't quite recall whether or not I ever finished it. Maybe I'll get a DVD of The Paper while I'm at it. So, I survived another ALC! Matt and I have been going to these since 2006 ... which is why the alumni association staff asked us, along with other long-time volunteers, to be a part of some roundtable discussions on topics of interest. "Can I have Alumni Engagement for $1000, Alex?" Join longtime OHIO volunteer and onetime Jeopardy! contestant Amy for answers to common questions about planning successful events, recruiting/retaining volunteers, and what Alex Trebek is really like. Discover the many tips and tricks she's gathered from other alumni leaders and explore ways to apply these best practices to your chapter or society. The session went pretty well, I think. I essentially went through all of my old files and made a note of anything still relevant/useful. 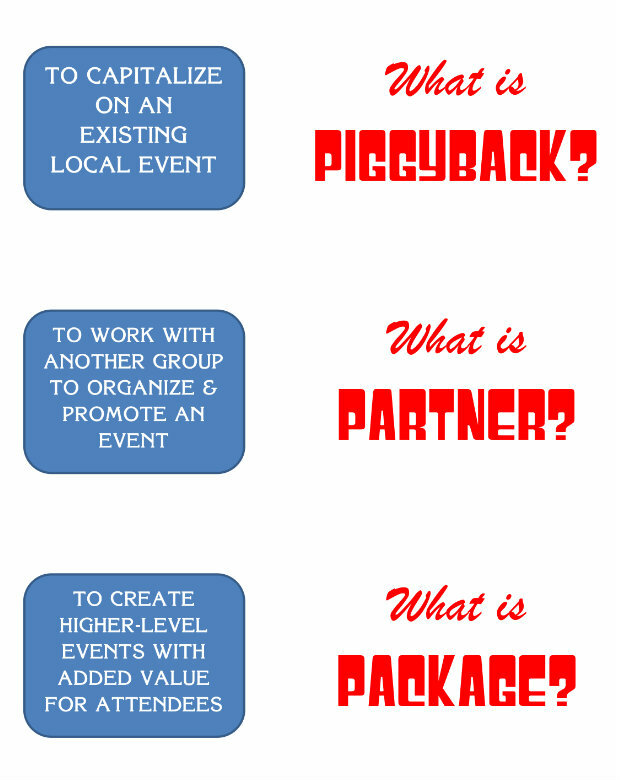 I compiled some pretty thick packets of handouts, with the understanding that it was something for people to take back and review with their chapter/society board members to determine what could be applied during the planning and execution of future events. And, of course, I did give a quick recap of my Jeopardy! experience -- not quite as detailed as the one I gave to a friend-of-a-friend at the bar later, but with enough insider info to make it interesting. The consensus seemed to be that I definitely need to get cracking on those "Getting Salty with Alex!" t-shirts. Oh, wait: Have I not mentioned that I've been on Jeopardy! on this blog? I suppose I should rectify that at some point. I'm listening to the audio version of Word by Word * and binge-watching Detroiters via Comedy Central On Demand** and they're making me miss my old day job. Kory Stamper describes the quiet hush of the editorial offices at Merriam-Webster, and I'm jealous that the marketing and sales staff are sequestered on a separate floor there. I remember the major shock to the system that occurred when those departments were added to the editorial and production departments' office space after the nuns retired and a new CEO came on board. Stamper also describes the antiquated technology and odd policies, especially with regard to coffee and to the procedure of circulating a memo instead of going over to speak with someone directly. I remember my first months with the publishing company as being very similar. I had another hit of déjà vu when I saw the office furnishings on Detroiters. One of the main characters has taken over his dad's advertising agency, and the office decor and amenities seem stuck in the '70s.... much like things at the Center when I first arrived. I would swear that the visitor chairs opposite the main desk (shown behind the characters in this GIF) are the same style and color as the visitor chairs in the front reception area where we were expected to take our morning and afternoon breaks from precisely 10 to 10:15 a.m. and 3 to 3:15 p.m. The credenza and some of the lamps in the background of this GIF also strike a chord. I'm sorry that I missed Stamper on her book tour, — the closest she got to me was Columbus earlier this month. She'll be in Pittsburgh in a few days, but I've got a trivia championship game that day, so I'm probably not going to make the road trip. Instead, I'll just do some discreet online stalking and catch up with news articles/radio appearances/her Twitter feed, etc. The TV show has been renewed for a second season, so I guess I can look forward to more "I used to have one of those in my office!" moments next year sometime. * It's read by the author, which I love in an audiobook. ** Not simultaneously. I multi-task, but not that much. I broke down and finished my taxes early — early for me, anyway; especially since the official deadline isn't until April 18 this year — and in the course of rummaging around in my various financial records, I came across a batch of savings bonds that I received as a kid. Turns out some of them have matured (unlike the recipient, lol) so I may as well cash them in . . . but not before admiring the artwork — note the Bicentennial label and the punch-card holes! I also have the original gift envelopes. I'm probably going to hang on to those for a while, on the off chance that I can figure out how to use them in a future papercrafting project. I'm into the usual stuff — books, movies, music, TV, sports, geeking around online, et cetera, et cetera, et cetera. — — Click the link to read A Little Bit about the Title. Your Ideas Intrigue Me . . . The game-winner was a last-second tip-in by Leon Williams (5). 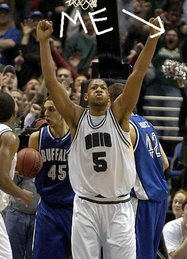 It was one of the top ten plays on Sportscenter that night. Since I was sitting behind the basket, you could see me in the video and in this AP photo. Overdue Media: Home of "Unshelved"